HAMPTON, NH – Division rivals meet once again this weekend as the Seacoast United Phantoms travel north to face GPS Portland Phoenix at Yarmouth High School (Yarmouth ME) on Saturday afternoon for a 7pm kickoff. Both teams are coming off victories against the same opponent after last weekend’s matches. 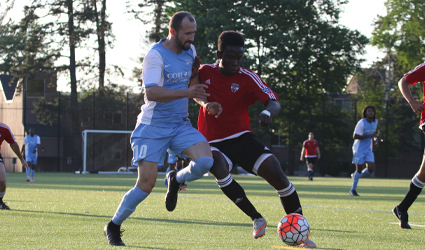 GPS hosted Westchester Flames on Saturday and defeated the NY side by the score of 2-0. The Phantoms then hosted the Flames on Sunday, winning by the score of 3-2. Goals were scored in the first half by Errol Reid, Junior Alencar, and Trent Lougheed provided the game winner late in the 2nd half. Phoenix striker Fletcher Eckern has scored 3 goals on the season to lead the offense, with Ifunanyachi Achara, Guilherme Da Silva Leme, and Skyler Milne each scoring 2 goals. Currently the Phantoms (4-2-1, 13 points) and Phoenix (4-2-0, 12 points) sit in 2nd and 3rd place in the division, as Western MA Pioneers (4-1-3) sits at the top with 15 points.